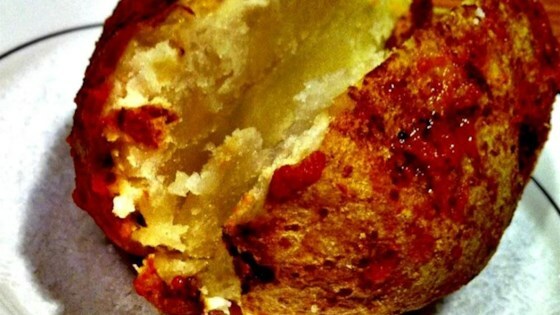 "You will not believe how much flavor will be added to the already delicious potato skin! I love baked potatoes and wanted to just TWEAK it up a little. I can eat these three times a day. Hope you enjoy!" Prick potatoes all over with a fork. Place each potato on a piece of aluminum foil large enough to cover completely. Spread 1 tablespoon butter on each potato; coat liberally with hot sauce and sprinkle with salt and black pepper. Wrap each potato tightly in foil. Place potatoes into a 13x9-inch baking pan. Bake in the preheated oven until potatoes are tender, 45 minutes to an hour depending on size. Unwrap and serve. THIS POTATO WILL NOT BE HOT-TASTING. The Frank's Red Hot® will leave spices that permeate the potato skin and leave it tasting wonderful and so flavorful. Garnish with butter and/or sour cream, chives, and any other goodies you like on your potatoes.